Celebrate New Year’s Eve on our Bourbon Street Balcony! Book your New Years Eve Balcony Party Tickets and have a destination on Bourbon Street waiting for you and your guests to arrive during prime time,10pm-1am. Enjoy dinner and then join us “above the crowd”‎ tossing beads and balcony treasures to the people reveling on Bourbon Street. 3 hours unlimited premium mixed drinks, bottled domestic and import beer, wine and Hurricanes along with a champagne toast at midnight, New Years Eve Party Favors and VIP Bourbon Street Balcony access with your own bar, bartender and some beads for the balcony. Just add more beads for the balcony! Ring in the new year on Bourbon Street at The Swamp, located at 516 Bourbon Street with a balcony that overlooks Bourbon Street and wraps into our French Quarter Courtyard overlooking the Carriageway entrance. You may even get a glimpse of the fireworks from the Carriageway Balcony. We offer New Years Eve Bourbon Street Balcony Tickets to have a Bourbon Street balcony location waiting for you and your guests to ring in 2019. Celebrate New Year’s Eve on Bourbon Street at our VIP Balcony Party at an actual Bar where the party never ends! 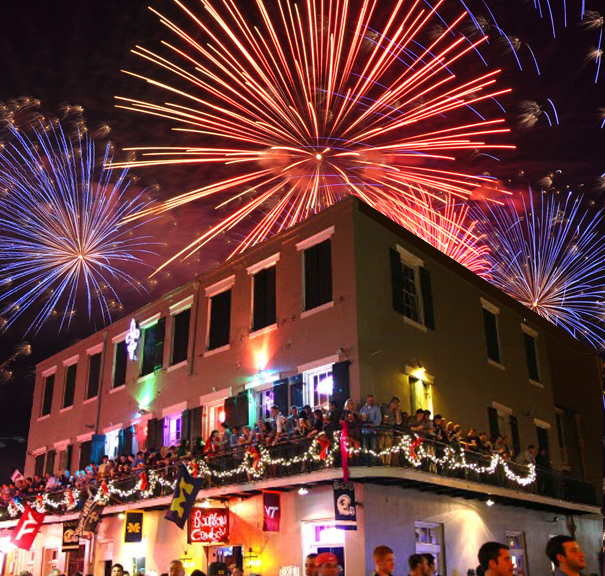 Limited availability for the VIP New Years Eve Bourbon Street Balcony Experience! At 1am, the party does not end. We will open to the public and offer Cash Bar. You are welcome to stay with your guests and continue to enjoy the festivities!